Not too much happening here, apart from the fact that on Sunday morning at about 9:15 the city is blowing up the CN railway station building. This 20 storey structure was found to be full of asbestos, and, except for the ground floor, has been vacant for many years. New members this week are Graham "Geordie" Flanagan from Stafford, "Clarkey" Clarke from Swindon, and Whaty Campbell from Bruggen, Germany. Welcome to the OBA! I'm glad that you liked the photo's. I was just browsing around the site. I didn't realize that you were stationed at Salalah and hadn't mentioned it before because most people have never heard of it. 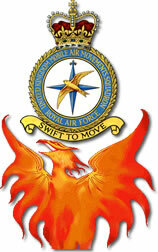 I spent a month there in 1962 on detachment with 5004 Airfield Construction Squadron. The Squadron were building the road down to a remote place on the coast called Raisut where they were also constructing the jetty which was used for unloading goods from the supply ships that came up the Gulf. In those days you were not allowed off the camp unless you were accompanied by one of the Sultan's Askari (soldier). Wild looking buggers with no particular uniform, armed to the teeth and sporting crossed ammunition belts over their chests like Mexican guerilla's. I can remember flying up there on an old DC3 of Aden Airways, the co-pilot was feeling tired so I spent most of the trip sitting in his seat. What a great view of the Gulf coastline. There were only three permanent members of the Officers mess there and during my stay I swelled the ranks to four. One was a civilian from the Ministry of Public Buildings and Works (his name was Roy), the others I can't remember. I do remember that there wasn't much to do in the evenings other than get drunk, which didn't really matter much because you weren't going anywhere anyway. The mess was really small, about four rooms in a hut with a balcony and palm trees in the front. Because there were no staff the idea was that we signed for our own drinks out of the bar, sort of an honour system. The trouble with this was that by mid evening everyone was half-cut and forgot to put down their drinks in the book allotted. The result of this dilemma was that the bar ran at a permanent loss. They had arrived at a wonderful solution however. Three days a week there was a regular scheduled flight from Aden to Bahrein that stopped over for lunch. Any traveling Officers were invited over to the Mess for lunch and drinks where, unbeknown to them, they were charged twice the going rate for everything they consumed! Result - a balanced bar book, give or take a little! Someone there kept a chameleon as a pet. The party trick with this poor reptile was to put it on one of the chairs and watch it assume the chintzy pattern of the upholstery fabric. We had a hurricane come through while I was there and we lost the roofs of several of the buildings. I can also remember fishing in the gulf for barracuda which we had cooked. Enough of this - I have to go. [Editor's Note: Ah! the memories - it brings tears to one's eyes! I recall that the 'fierce' Askari guards would not go outside the perimeter at night, and so when we were offloading the supply ship at Raisut, each truck was accompanied by a person riding shotgun, armed normally with a sten-gun. That chameleon, Charlie was his name, would have lived to a ripe old age had it not been for the fact that he tried to impersonate the road one morning, and, in all liklihood was served up for dinner advertised as "Mystery Meat". PS Still looking for the photos from Dubai. Well I found a few photos that represent the 'real' SOAF and not the sanitized official RAF historian version!! Here is a rundown on what the photos are. I apologize for the fairly poor quality of the scans, but they were all processed in local stores in Seeb and Muscat, and I assume that they didn't use Kodak quality products! Consequently the original photos have faded and the colors got very washed out over the years. As for dates, I have no idea I'm afraid! The zip file of 1-11 pics (1-11.zip) are to my knowledge fairly unique and represent one of those incidents that was hushed up. I managed to snap them undetected as any picture taking of this event was definitely banned. One day we had a unusually large storm come through the Seeb region. Big storms there were a rare event and this was a big one. There were quite a few deaths reported after the flash floods that occurred in the wadis around the Capital. High winds accompanied the storm and this was the result at Seeb Military Airport. The BAC 1-11 in question hadn't been chained down on the dispersal by the Airworks flight line crew. The 1-11 jumped its chocks, was blown across the pan mounted the revetment surrounding the dispersal and came to rest as you see it. It was referred to in the SNCOs Mess as the SOAF attempt at a space shuttle!! The camel_move.zip file is a set of pictures of a move of the Sultans Racing Camels from Seeb to Salalah on a SOAF C130. These camels were worth thousands of dollars each and had never been moved by air before. As they belonged to the Sultan they attracted a lot of attention, including (officer working.jpg) a rare example of a SOAF Officer (Dave Webb) actually working outside in the high temperatures instead of directing it by radio from his air conditioned office!! The picture entitled "camelinC130" shows the bad tempered beast in the Herc, with Tony Davies on the right in khakis (my partner in crime in Air Cargo Seeb). Khasab.zip is a set taken at SOAF Khasab. This was the last stop before the Straits of Hormuz and is actually separated from the rest of Oman. Originally the only aircraft that could get in there were Skyvans and Defenders, but after Uncle Sam realized the strategic importance of Khasab a nice new concrete runway was installed, allowing the SOAF C130s to come in and therefore increasing the quality of life as it allowed for the airlift of better and more supplies on a more regular basis than the Skyvan schedule would allow. I enjoyed doing detatchments up there as it was still like the Wild West. I remember Dave Hill (a Bell 205 pilot) was the OC Khasab - the helo was basically the base runabout! The picture of the Khasab movers was taken in front of the passenger terminal - basically an open goat pen. Finally a few odd pictures taken at Seeb. These include a shot of the dust bowl that we lovingly referred to as Air Cargo Seeb, a couple of shots of a visiting HeavyLift Belfast that made all of us movers feel quite homesick. The shot of a the rapier unit being manhandled onto a SOAF Herc features yours truly in a typical pose of watching the Cargo staff work while I supervise in a way befitting a SNCO!!! The grow-bags and baseball caps were the usual dress of the day and just one more reason why the seconded RAF officers hated us!! only available in Oman. I have seen a copy of it and it is superb, with many photos of SOAF from its beginnings to the present day. Needless to say I loved my time out there (most of the time anyway) and remember it fondly. Subject: The whereabouts of Bob Davies!!! I e-mailed Bob at Meggitt and received the attached reply. When he gets back to Blighty, I'll call him at his place. Bob parlayed a passion for model planes into a business which has made him quite wealthy. He has several real planes at his farm, and, as you can see, an airstrip in the back yard. It wasn't easy for him, but he persevered, and it has paid off. We'll get him into the fold quite soon. Rob is away in the USA on Meggitt Defence System business right now, although I did show him your e-mail before he left, and he is really pleased you guys are keeping in touch with him. I can tell you that Rob is well and still operating his P-51 Mustang "Big Beautiful Doll" out of his farm at Woodchurch, doing lots of airshows in the summer months. His airstrip is a bit waterlogged at the moment, so not much actual flying takes place at this time of the year; just lots of maintenance! No doubt he will get me to send you another, more meaningful message when he is back in circulation in the U.K.
Keep up the good work. Like others I too get a little nostalgic from time to time. Just a wee comment on George Reeves message and your footnote. I too took a trip in a RNAZ Bristol Freighter during the Borneo saga. It was early 64 and I went on R and R to Butterworth heading for 'The Runnymeade Hotel' on Penang Island (It was St. George's Island - probably still is; good trivial pursuit question). Who in their right mind would go in a B.F? - a desperate MAMS officer for a start! Now turning to the 40,000 rivets in loose formation - surely only 20,000 because I well remember we used the same expression about the good old Beverley and look how much bigger 'she' was! Just an aside. PS. I also took a look at the Masirah page, I was OC Supply there when the fuel storage tanks were extended (circa: late 1971-early 1972) and I have a complete photographic and narrative record of this, at that time, unique, hydraulic ram lifting construction. I keep meaning to pass it on the to RAF Museum or whomever. It was a tiny bit of history in the making. And who can ever forget the mobile laundry service whose Indian proprietors served the best curry in town every Friday. To all freinds and aquaintances, please note my change of address.. to Willie C, my 1965 steam driven computer didn't like your last message. Graham "Geordie" Flanagan sent a profile in, accompanied by a couple of photographs. One of them is the group picture of 42 Junior Air Movements Course at Abingdon during the winter of 67-68. I recognized Bob Thacker in the crowd! The other picture is taken during the Queen's visit to Brize Norton sometime during the early 70s. There's a beautiful line-up of Movers wearing brand new overalls and sporting very shiny shoes being inspected by HM Queen Elizabeth II! Peter Chappell has his profile in - hasn't changed a bit except for a wee bit of winter insulation going on. Spider Jolley has also provided us with a glimpse of his life - including the time he almost lost it when he was hit with malaria while working in darkest Africa for the UNHCR. Last, but certainly not least - I managed to put together a profile for Ian Stacey. During the many exchanges we had over the past few months I came up with enough stuff to put on a page. I will throw some photographs in this weekend when I get them back from processing. The Khormaksar Photo Page has been updated with an additional 5 images from John Holloway. Thanks also go to Merfyn Phillips for some of the pictures. Just follow the links from the Khormaksar Article. That's it for this week. We're still missing a lot of Profiles, so feel free to put finger to keyboard sometime soon!